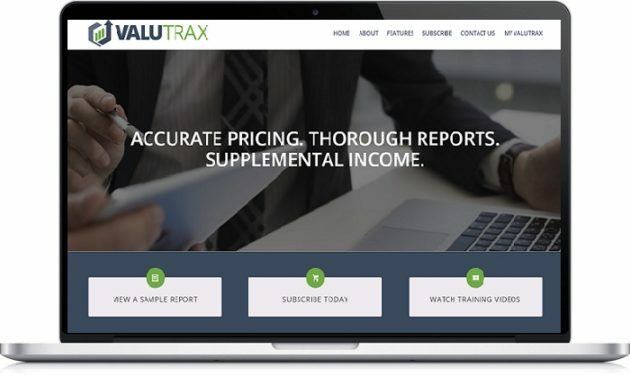 ValuTrax offers a web-based business valuation tool which can be used to estimate the value of the company based on income statement and balance sheet data. Additionally, market data multipliers are used. 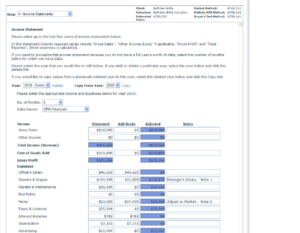 The user is asked to input income statement and balance sheet data into the easy-to-use system using the web interface. The income statement data can be inputted for four periods, and the current period is automatically annualized in case the user chooses so. Additionally, as data for a new year is entered the user has the option to copy the data from the previous period to speed up the process of data input. After copying the values from the preceding year, the user can then edit the differing values. 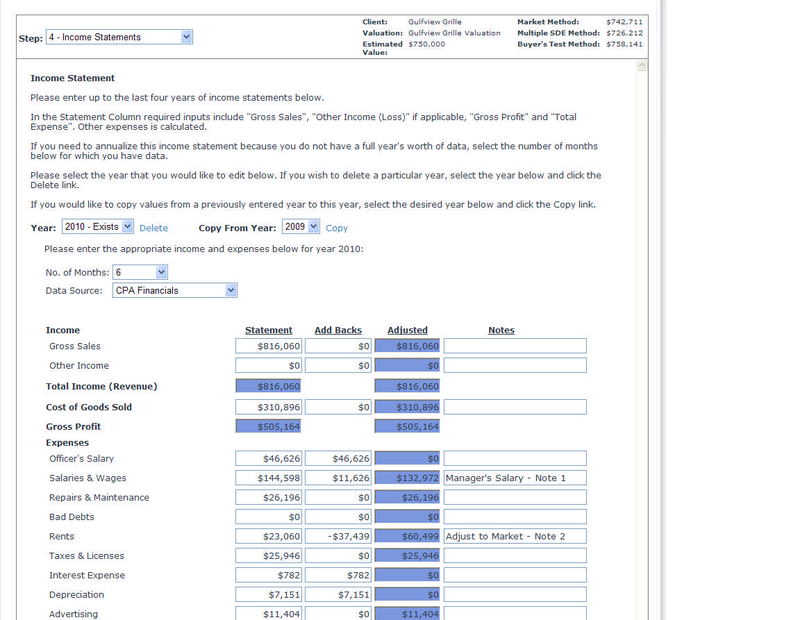 Balance sheet data input allows the user to input both the book values as well as estimated fair values. 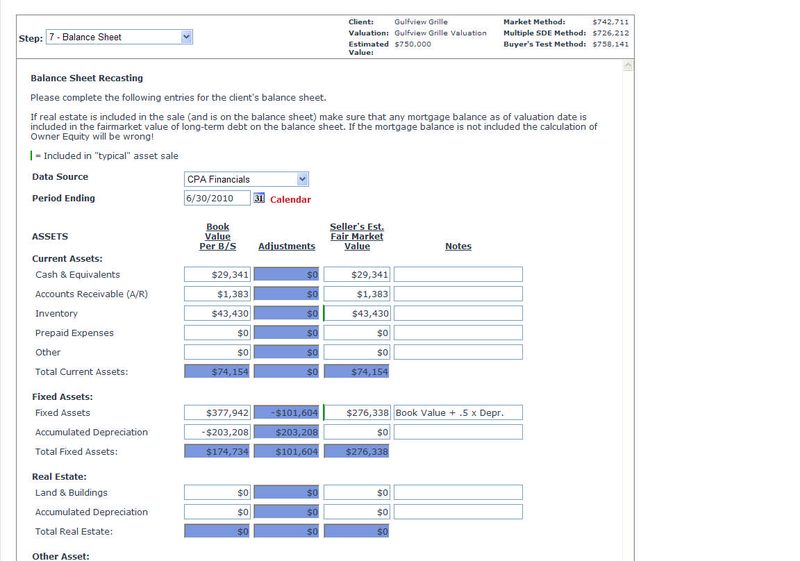 The user can also add notes for each balance sheet item. Valuation is performed using three methods: market method, multiple of seller’s discretionary earnings (SDE) method, and buyer’s choice method. 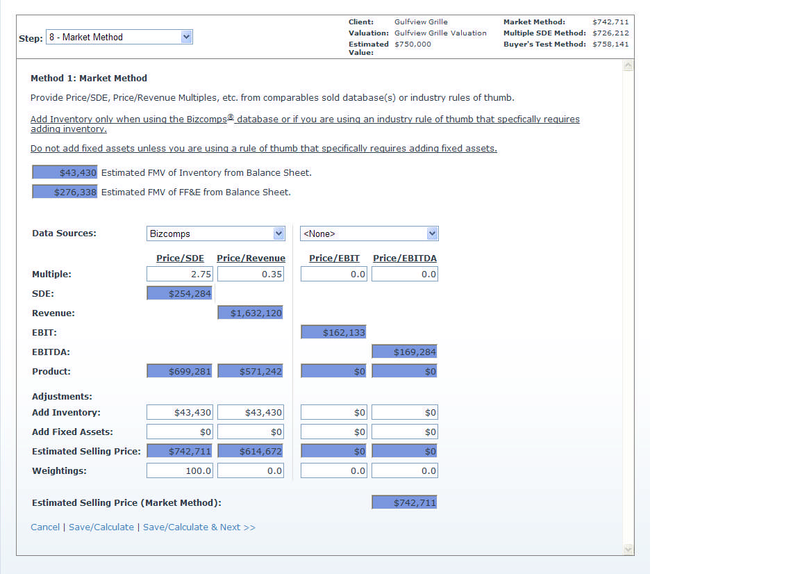 The multipliers in market method include price/SDE, price/revenue, price/EBIT, and price/EBITDA. BizComps database is used in valuation and the user can assign a specific weight for each multiplier. 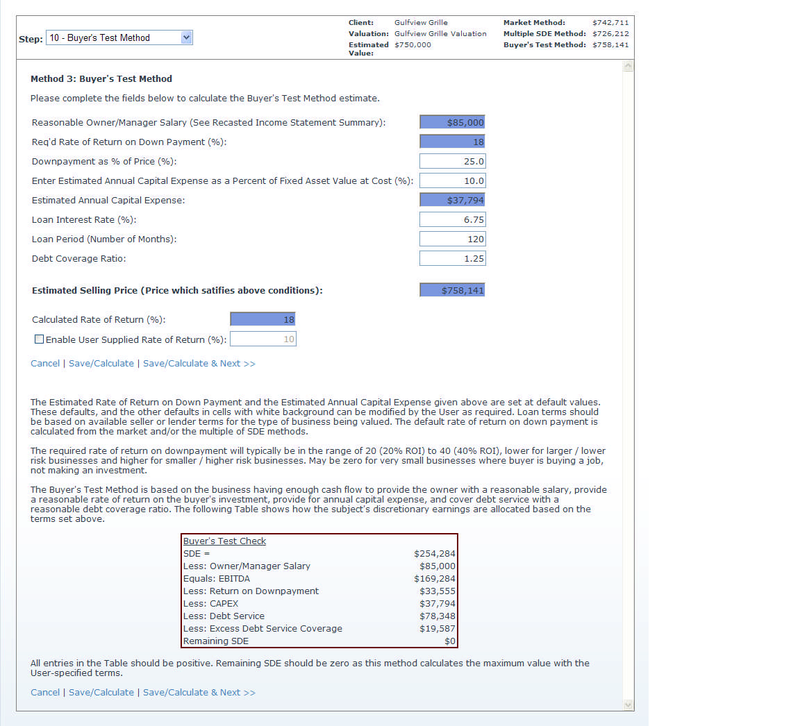 Multiple of SDE method asks the user to assign a rank and a multiplier to ten different factors used in the valuation. The rank of each factor defines how important it is to the business and the multiplier is used to compare the factor to industry. Multiple of SDE method is highly subjective, which means that the multiplier values and rankings should be assigned with consideration and the resulting valuation result should not be taken for granted. 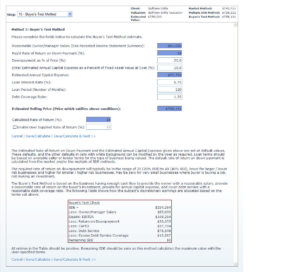 The final method in ValuTrax valuation tool is the buyer’s test method, which takes a look at valuation from buyer’s perspective. Buyer’s test method is used to estimate how much the prospective buyer would be able to pay for the business. 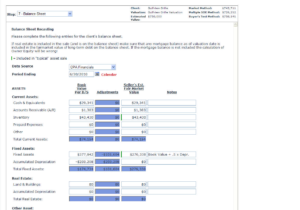 The user inputs values for, e.g., down payment, loan interest rate, and loan period. 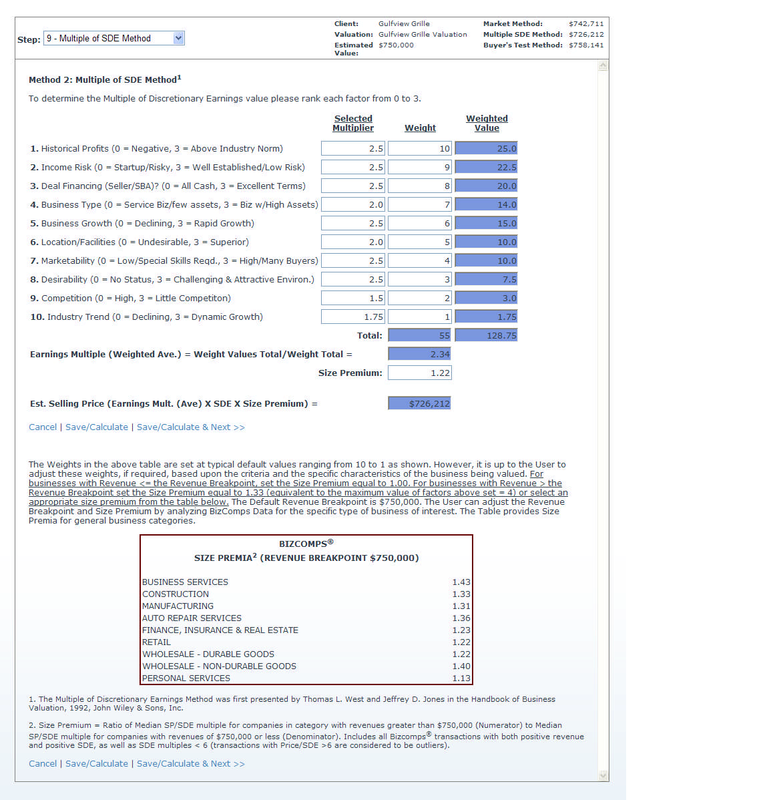 Based on the valuation process, the user can generate a 16-page valuation report in either PDF or Word format. 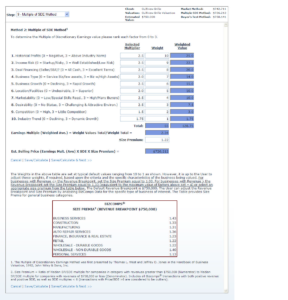 The latter option allows the user to easily modify the report. The report itself leaves lot to hope for. Valuation methodology is not discussed in detail and most of the 16-page report consists of income statement and balance sheet data. A sample report can be downloaded from ValuTrax’s website here. A complete tutorial for using the ValuTrax valuation tool as well as an extensive video library showing the use of the system step-by-step can be found from the website. 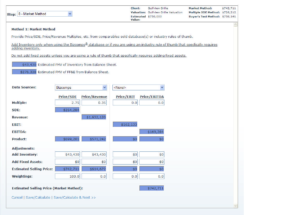 ValuTrax provides a relatively simple but cheap and easy-to-use tool for business valuation.